SEOUL, South Korea--(BUSINESS WIRE)--Samsung Electronics Co., Ltd., the world leader in advanced memory technology, today announced that it has launched an 800-gigabyte (GB) solid state storage drive—the SZ985 Z-SSD™, for the most advanced enterprise applications including supercomputing for AI analysis. The new single port, four-lane Z-SSD features Z-NAND chips that provide 10 times higher cell read performance than 3-bit V-NAND chips, along with 1.5GB LPDDR4 DRAM and a high performance controller. 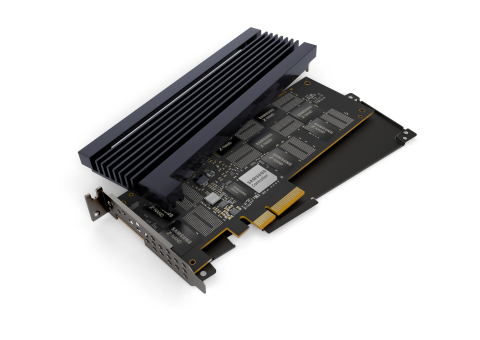 Armed with some of the industry’s most advanced components, the 800GB Z-SSD features 1.7 times faster random read performance at 750K IOPS, and five times less write latency – at 16 microseconds, compared to an NVMe SSD PM963, which is based on 3-bit V-NAND chips. The Z-SSD also delivers a random write speed of up to 170K IOPS. Samsung will introduce its new Z-SSD in 800GB and 240GB versions, as well as related technologies at ISSCC 2018 (International Solid-State Circuits Conference), which will be held February 11-15 in San Francisco. ™ Note: All brand, product, service names and logos are trademarks and/or registered trademarks of their respective owners and are hereby recognized and acknowledged. Z-SSD is a trademark of Samsung Electronics Co., Ltd.
* Editor’s Note: The premium SSD means an SSD with IOPs exceeding 550K for random reads, and latency lower than 20us.